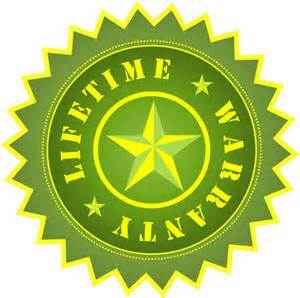 All pool companies will show you their lifetime pool warranty and/or 20 year liner warranty. There is a lot of fine print in the warranties and I try to be as upfront as I can be about what it covers and what the pool warranty doesn’t cover. Generally the lifetime warranty covers the pool wall panels from having a defect. That warranty is essentially useless as the modern pool panels will never deteriorate or have a problem. However my panels do come with a lifetime warranty from the manufacture and I back that with a free labor warranty for any issue with a pool panel, but this issue has never come up and I seriously doubt it ever will. The next warranty is for liners. I sell liners from three different manufactures to help have a wide range of color and design. All three companies have the same general warranty. It covers the seam from having a defect. I would say one liner out of 20 will have a seam defect from the manufacturer and getting a new liner is easy and straight forward. I give free labor to replace the defective liner (industry standard), but I will also cover the cost of replacing the water too and pick the exact date you want the replacement done. The warranty does not cover holes in the liner away from a seam. It does not cover if you empty your pool and try to fill it back up and the liner shrinks. The warranty doesn’t cover the liner fading from direct sunlight (generally 6-8 years when this happens). Most of the pool accessories will come with limited warranties like diving boards, hand rails, etc. but these aren’t ever an issue. We won’t install a faulty accessory and if/when we get a defective accessory, our pool distributor is great at replacing the damaged product. Automatic pool covers come with different warranties depending on which make and model is purchased. Generally there is a full year warranty (labor and parts) and a 5 year parts warranty. Each type of heater, pool pump, filter, etc has a different type of warranty. They generally don’t last long as improper use can cause significant damage. We will help file any claims for any equipment having issues. We will come out and fix a leaking valve, or damaged o-ring for free for lifetime. In regards to leaking: underground leaking is covered by a one year free labor and materials and a 5 year free material warranty. There is no warranty on not cracking your existing driveway or tearing up your landscaping. Generally speaking the contract will outline in bold capital letters that we are not responsible for your driveway during the construction process. Depending on the yard, we usually try to not use the driveway with big trucks and the concrete trucks, but sometimes it is unavoidable.